American shoppers at such mighty chain stores as Costco, Trader Joe’s, Ralph’s and Pavilions are all set to meet the new sensation. This one whets the fabled appetite for that long succession of well-loved Japanese imports in the true tradition of sushi, the all-American favorite. All previous indications are present and unmistakable. Mochi Ice Cream is poised to take over the mainland and all set to mainstream in a very imminent way! Mochi…Mochi…Ice Cream, you say, a little ambiguously as you deliciously let the syllables roll off your tongue. O yeah! that very catching, new treat causing all the commotion. No, not Nomo, or any of those subcompacts, or even a new CD. Well, forget the head scratching! The people to set you straight are right here in our own backyard. The Mikawaya Bakery-Confectionery in the heart of downtown LA in Little Tokyo are the giddy makers — and originators — of this arguably most unique of concoctions ever to hit American shores. Yes, Mikawaya’s Mochi Ice Cream is ready to hit the shelves of those omnipotent chain stores as it homes in and takes its inevitable journey to the heart of mainstream America! Joel Friedman, officially the chief financial officer/controller for the family-owned company and at the same time a-once-and-future inventor in his more informal, but no less active capacity for the same, is proud father all over again as he admits that Mochi Ice Cream is indeed “his baby.” His other babe, his wife with whom he celebrates a 30th year anniversary this January! — Frances Hashimoto — Mikawaya president and scion of the clan who has owned the company for 91 years since they acquired it in 1910, agrees wholeheartedly. It is really a marriage made in heaven. Joel’s and Frances’ that is, and that of their most famous and successful, albeit, self-styled yet joint product and novel confection. In fact to point out that Mochi Ice Cream is a perfect metaphor for its owners’ marriage is merely stating the obvious. To arrive at a simple definition of Mochi Ice Cream, it is necessary to call to mind the process of making it. Mochi Ice Cream after all calls for, quite literally, melding the traditional, well-loved Japanese delicacy or dessert known as mochi — and the classic American favorite, ice cream. Hence, Mochi Ice cream…something in the order of the yukimi daifuku already developed in Japan, in its rudimentary form one could say. So to the uninitiated, it is a very good place to start. Mochi — preferably — is a very fine, exquisitely grained, chewy rice cake dough. On the other hand, Mikawaya’s Mochi Ice Cream is more exactly a soft middle of impeccably, delicious ice cream nestled inside the best mochi this side of Japan. So if you’re thinking, East meets West in the best of possible ways and that sort of thing…well, you’re exactly right! But if you think that the process simply involves sticking a scoop of ice cream in the middle of a piece of mochi, well you’re dead wrong! In fact, the evolution of Mochi Ice Cream has come about over a painfully, slow period that comes closer to 10 going-on 15 years. The quest to develop a novel food product that would cross ethnic boundaries eventually took more than a decade of experimentation and research and hundreds of pounds of ingredients. But what was involved in “doing it right” and in perfecting Mochi ice cream? “We had to formulate an ice cream specific to mochi.” Friedman explains. Their starting point was two distinct products which could be eaten and enjoyed apart from each other. Combining the two meant developing them in a way that they would complement each other, the mochi ending up being flavored the same as the ice cream and, finally, melding and fusing the two into one great dessert. It has been said that the secret to this latest Japanese crossover lies in its ” authentic ice cream and solid mochi texture.” Eventually and after much of the same painstaking R & D, Mochi Ice Cream flavors have now grown to a delectable seven: strawberry, vanilla, mango, green tea, red bean, coffee and chocolate. What transpired after, however, is hardly a secret. Mochi Ice Cream proved to be the blockbuster seller of Mikawaya. “It caught us by surprise,” Friedman reveals. “The market took all the mathematical calculations and threw them out of the window. Our new product has (been doing) fantastically well…” The first signs of burgeoning business forced the building of an additional 10,000 square feet of warehouse floor space to its main site of company operations in Little Tokyo. Next order of the day was testing the market in Hawaii where the new ice cream confection ate up all the market projections and surpassed every expectation. After that, formally debuting at the Bristol farms in Pasadena here in Los Angeles was a no-brainer. Indeed the rest of this glorious history is still being written, but this time closer to home. The secret is out all right: Mochi Ice Cream has gone mainstream! And after Ralph’s, Trader Joe’s, Costco, etc…what next? It seems the world would be Mikawaya’s oyster after all! Not bad for what started as a Mom and Pop operation that had its origins with first generation issei. Established in the early 1900’s, it was then housed in its initial location in East First Street and named after Mikawa, a town in Aichi-ken, Japan where its original owners came from, plus the word ya, Japanese for store or shop, hence Mikawa-ya. The first of the clan, Ryuzaburo Hashimoto, Frances’ father then bought the operation in 1910 and the bakery/confectionery store has been in the family since then. In1925,Ryazaburo’s nephew Koroku and his wife, Haru, relocated to another address in First Street and over the years have moved to various others in Little Tokyo when Frances, herself, took over in 1970. There was a brief interlude during the war years when Mikawaya experienced a short interruption in service as the entire family was relocated to Poston, Arizona. Postwar they returned next door to the site where it overtook them. Years later in 1974 Frances opened new quarters in Fourth Street where she thought redevelopment efforts would take place in Little Tokyo, and built a factory there as well as expanded their retail operations. 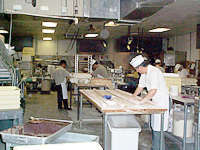 Marriage to Friedman in 1972 and the birth of sons, Bryan (25) and Ryan (23), and many mochis after, Mikawaya now boasts of five retail outlets: two in Little Tokyo and one each in Gardena, Torrance and in the island of Kauai in Hawaii. As Mikawaya’s pioneering maven, Hashimoto is really at her best elements. She is a veritable posterwoman for her efforts as a Little Tokyo community leader recently characterized by Councilwoman Jan Perry as “surpassed by none.” Among others Hashimoto has been serving as Director for the Little Tokyo Business Association from 1974 to the present as well as the hugely successful and recently concluded Nisei Week Japanese Festival since 1978. This community activist has also been at the forefront of the Little Tokyo Community redevelopment efforts serving on the Mayor’s Advisory Committee since 1980. Very recently in July this year, this former teacher by profession was honored with the prestigious Japanese American Cultural Community Center Pacific Pioneer award alongside notable local business entities such as Cushman Realty and Sanwa Bank. As for Mikawaya, its offerings to the public began modestly with any of a variety of well-loved Japanese sweets called wagashi. Major of these is what is known as manju also made of mochi flour with sweet bean paste filling. Manju for special occasions include a simple, white manju stamped with a kiku or chrysanthemum on the outside eaten during Buddhist funerals; a white or pink manju with a tsuru-kame (crane and turtle) which is a felicitous symbol of long life popular at weddings and other happy occasions; a kashiwa-mochi or manju wrapped in oak leaf design symbolizing strength and used for Boy’s Day; and, finally, the sakura-mochi or manju wrapped in a cherry blossom-leaf motif as well as a tri-colored (white, green and pink) mochigashi clearly associated with Girl’s Day. Obviously it is not just the store’s physical operations that have been augmented over the years. The husband-and-wife-team of Hashimoto and Friedman has succeeded in securing for Mikawaya an unassailable reputation in the local community built on the premium quality of their superb family of traditional Japanese pastries. And then some. Their combined innovativeness has also resulted in a genuinely, unique line of products, one in particular — Mochi Ice Cream — which actually seeks the true marriage of two cultures! This is not just crossing over for the sheer pleasure of it, but in Mikawaya’s case — and certainly with that of Frances and Joel — it is more about the hopes of clarifying many-a-cliched boundaries and bridging these.